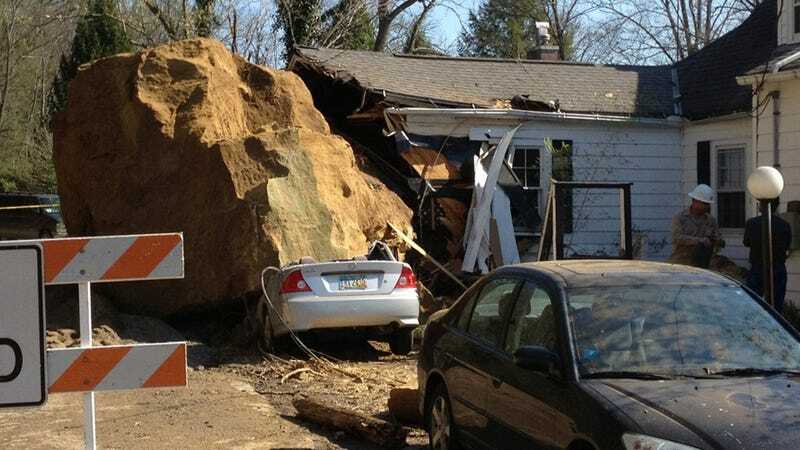 This 25-foot-wide boulder broke free from a hillside and landed on two cars and a house on Tuesday in Athens, Ohio. Though a family was inside of the house at the time, no one was injured. The boulder tore down utility lines, and it was so heavy that it broke a waterline underneath the street. A bystander who saw the boulder fall told Athens Ohio Today, "at first I thought it was thunder, then I saw sparks and thought it was firecrackers." Two homes were evacuated and residents will not return until the cause of the falling rock is determined.